Cisco Network Foundation Protection (NFP) is an umbrella strategy encompassing Cisco IOS Security features that provides the tools, technologies, and services that enable organizations to secure their network foundations. NFP helps to establish a methodical approach to protecting router planes, forming the foundation for continuous service delivery. the management plane allows the ability to manage network elements. The vast majority of packets handled by a router travel through the router by way of the forwarding plane, or data plane. However, the system’s route processor must handle certain packets, such as routing protocols, keepalives, packets destined to the local IP addresses of the router, and packets from management protocols and other interactive access protocols, such as Telnet and Secure Shell (SSH) Protocol. This type of traffic is often referred to as control plane traffic. Packet overloads on a router’s control plane can slow down routing processes and, as a result, degrade network service levels and user productivity. One cause for an overburdened router control plane is a router making inefficient use of shared CPU and memory resources. The same result can occur if reconnaissance or denial-of-service (DoS) attacks appear on the control plane, or if a routing protocol otherwise misbehaves. For example, if a high volume of rogue packets generated by a virus or worm is presented to the control plane, the router will spend an excessive amount of time processing and discarding unnecessary traffic. This can eventually overwhelm the route processor, which is responsible for handling router control plane functions, and possibly bring router processes to a halt. Following is an overview of several Cisco IOS Software security features that protect the control plane of networking devices. Receive Access Control Lists: Receive Access Controls Lists (rACLs) are designed to protect the route processor on high-end routers from unnecessary traffic that could potentially affect system performance. The rACL feature uses standard or extended ACLs that control the traffic sent by the various line cards to the route processor on distributed architectures such as Cisco 12000 Series Routers. An rACL does not apply to transit traffic. Control Plane Policing: The control plane policing (CoPP) feature significantly improves upon the rACL feature. Whereas rACLs allow the configuration of basic “permit” and “deny” filters for traffic destined to the router CPU, the CPP feature extends this by allowing users to configure a quality of service (QoS) filter that can also “rate-limit” this traffic. Control Plane Protection: Cisco Control Plane Protection (CPPr) extends the CPP feature by enabling classification of the control plane traffic based on packet destination and information provided by the forwarding plane, allowing appropriate throttling for each category of packet. In this article I will explain the control plane policing (CoPP), a feature introduced with release 12.2(18)S.
The CoPP feature protects the control plane of Cisco IOS Software-based routers and switches against many attacks, including reconnaissance and denial-of-service (DoS) attacks. 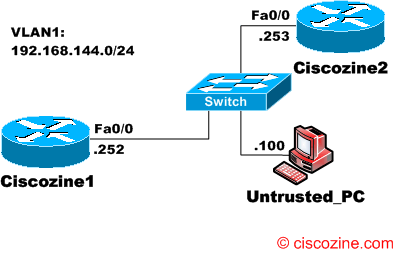 In this manner, the control plane can maintain packet forwarding and protocol state despite an attack or heavy load on the router or switch. Suppose to have a network (192.168.144.0/24) with two routers (.252 and .253) and an untrusted PC (.100). It is required to protect Ciscozine1 control plane from ICMP flood attack. Ciscozine2 (the trusted host) can forward ICMP packets to the control plane without constraint, while all remaining ICMP packets will be policed at the specified rate. To test the CoPP feature, I use the ping command, with a size of 1250byte. As you can see, all ICMP packets sent by Ciscozine2 are received, while some ICMP packets from the Untrusted_pc are lost due to the control plane policing feature. To display the configuration and statistics for a traffic class or all traffic classes in the policy maps attached to the control plane for aggregate or distributed control plane services, use the show policy-map control-plane command in privileged EXEC mode.